To say I’m excited about the Cotton Bowl tonight is an understatement. I even sported my new Johnny Manziel jersey at work to several meetings this morning. What’s my prediction for tonight? Heisman jinx or jolt? You hear a lot about the Heisman jinx–that the Heisman winner plays poorly in his bowl game. But the last 3 Heisman winners have won their bowl game. Look for Johnny Manziel to continue this streak by shredding a porous defense that’s given up more than 500 yards of offense in 2 out of its last 3 games. Turnover battle – High scoring matchups often hinge on who wins the turnover battle. When both teams’ defenses have trouble stopping the other squad, sometimes the game depends on which team stops themselves. Over his career, Landry Jones has been interception-prone, especially when under pressure. If the Aggies can’t stop the Sooners defensively, they’ll benefit if the Sooners derail themselves with turnovers. Running game – While everyone has keyed on the passing duel between a Heisman winner and a Big 12 record setter, the running game could be a decisive factor in the contest. Opposing teams have gashed OU’s run defense, to the tune of 900+ yards in the last three games. If the Ags can find success toting the football while keeping the Sooners one dimensional, then they will cruise to victory. If the Aggies pull off the victory, they’ll finish with 11 wins and a top 10 ranking for the first time in over a decade. It would poise them for a possible national championship run behind returning Heisman quarterback Johnny Manziel next season. What does doubt look like in the Christian life? As the great Lee Corso would say, not so fast my friend. Don’t count the Big 12’s Oklahoma out so fast. 1.Yes, OU has given up a lot of yards in the last month, but they’ve also played the nations #3, #5, and #11 offenses in that span. Two of those teams they have held below their offensive average for the game. The one game where that was not the case was against West Virginia, when the Sooners were unprepared for Travon Austin playing running back and were repeatedly gashed. My money is on that being the exception rather than the rule. Also, A&M won’t enjoy the same advantage as they do in the SEC in that their offense is completely different than what the other teams see each week. It seems like SEC defenses always needed the first half to adjust to A&M’s offense, but that they were much more successful defending it in the second half. OU sees the uptempo offense every other week, and so they won’t give up as many first quarter points as many SEC teams did to the Ags. 2. Jones’ reputation for turnovers persists, even though he has reduced them significantly this season. In the past two interception games were the norm for him. 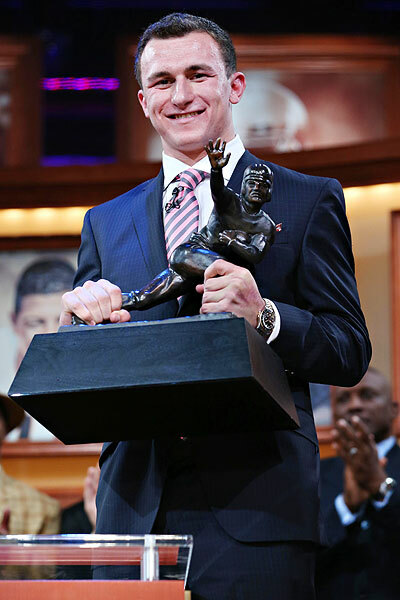 This year he only has one, while Johnny Manziel has two. 3. While OU looks like it has been gashed, those numbers are again inflated by one mind-blowingly bad game (which the Sooners still found a way to win). WVU rushed for over 450 yards against the Crimson and Cream. While they haven’t been a great run defense this year, they have been effective for most of the season. As with most football games, it will come down to which team can effectively control the line of scrimmage. Can OU effectively stop A&M’s running game while playing disciplined defense in order to prevent Manziel from doing what he does best: turning seemingly nothing into a big play. Can A&M and Damontre Moore get enough pressure on Landry Jones to change him from a precision passer to a shaky QB who makes questionable decisions?